Česká zbrojovka Uherský Brod (ČZUB, Czech Arms Factory) is a leading Czech manufacturer of pistols, rifles, shotguns, submachine guns, under-barrel grenade launchers, ballistic protection products and accessories. With CZK 5 billion (USD 218 million) annual sales (2017) the company belongs to the top ten biggest manufacturers of the world, and top five of automatic weapons manufacturers. Currently with 2000 employees, 95 % of the production is exported to a hundred of countries. 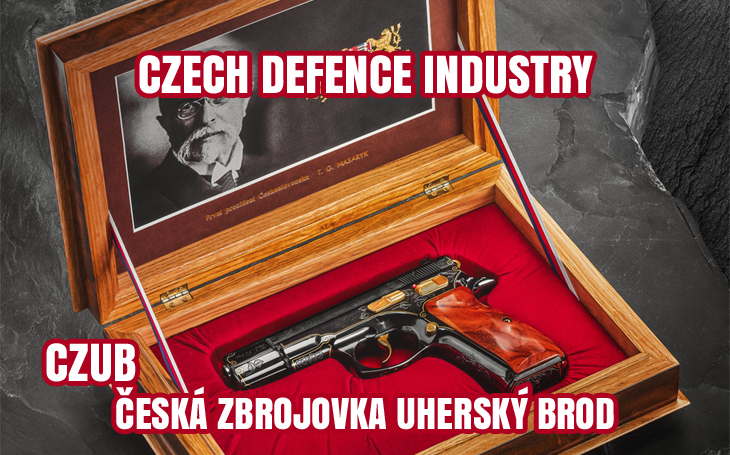 After the series of articles on modernization of the Czech Army, Czech Defence Journal will now focus on the Czech defence industry, and present notable companies, which combine the old Czech traditions with innovative approach and technologies. The Uherský Brod factory of Česká zbrojovka was founded in 1936 while Czechoslovakia was under rising threat by nazi Germany, and needed to move its strategical industries as far from the western borders as possible. Initially the branch plant of Česká zbrojovka was based in Strakonice, in Southern Bohemia. Before WW2 ČZ’s production consisted mainly of aircraft machine guns and signal pistols, which was continued by the Germans after the 1939 occupation when the production was completed by infantry machine guns too. This sinister chapter of history brought experience and technological development though. The Sa vz. 58 „submachine gun“, which in fact is an assault rifle, was until recently the main rifle of the Czech Army, constituted the main personal armament of the Czechoslovak Army since 1958, and was a high-grade alternative to the Soviet AK-47 Kalashnikov. The Czech Army still uses these rifles together with their replacement: the CZ 805 BREN and CZ BREN 2. Nearly a million were produced. The Škorpion vz. 61 compact submachine gun was an innovative attempt to fill in the gap between classic submachine guns and service pistols, and was met with a world wide success. Czechoslovak Army used them as a personal sidearm for lower-ranking staff, vehicle drivers, armoured vehicle personnel and special forces. About 200 thousand were produced. And, of course, the CZ 75 pistol. Admired for its perfect ergonomics, and with its unique double action trigger mechanism, it helped to define a new category of pistols: the Wonder Nines. These are large capacity SA/DA pistols in 9mm Luger calibre and the CZ 75 has been one of the most popular of them for many years. Over a million were produced so far. In 1992 Česká zbrojovka, a state company under the communist regime (1948–1989), became a joint stock company. It is owned by Czech shareholders. In 1997 the CZ-USA was established as daughter company in the United States to deal with sales and servicing. In 2004 Zbrojovka Brno, another famous Czech arms production brand, became part of the corporation, and since 2011 CZ participates in the rearmament process of the Czech Army with serial production of a new generation of CZ assault rifles (BREN and BREN 2 since 2016), submachine guns (CZ SCORPION EVO 3 A1 ), under-barrel grenade launchers (CZ 80 BREN G1) and the CZ 75 SP-01 PHANTOM pistols.